The premise of 32 Candles is that a girl who had once watched 16 Candles and imagined her own Molly Ringwald Ending gets to try to make it happen with the same boy years later when they’re all grown up. What movie have you mentally inserted yourself into? Did it ever come close to coming true? My answer isn’t what you might expect, and nothing like it ever ended up happening to me, clearly. The only movie that I can remember imagining myself in was Labyrinth. Logic puzzles, geeky adventure, mazes, Jim Henson muppets, 80’s music, mysterious David Bowie. Then again, maybe that’s exactly what you might expect. 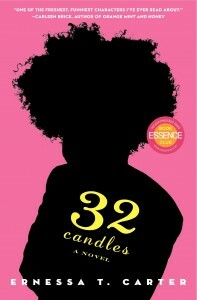 Oh, and go buy 32 Candles. Hooray Ernessa! In the past couple of weeks, I’ve gotten pregnancy announcements from three friends. A college friend I’ve mentioned before, whom I long ago anticipated would have fertility problems. When I announced my own pregnancy to her I included a subtle hint about my own difficulties conceiving, and she took the bait. I’ve since been able to give her advice and support as she moves up the ladder of the treatment process. Now, success! A graduate school friend I’ve also mentioned before in the context of wanting to make pregnancy announcements sensitively. A co-worker I haven’t mentioned before who has really been through the wringer in terms of failed treatments and the adoption process. Over the course of the past decade all of the women in her division, all around her age, have gone from childless to having one child to having two and being done; meanwhile, her tally has stayed at zero. Until now, thanks to DE! I’m not sure if it’s just a sign of her openness that secretaries are randomly telling me about her DE conception, or whether I should be horrified at the breach of privacy. Let’s be optimistic and go with the former. With each of these, I was genuinely happy to hear the news. Not just mildly “oh how nice” happy, but really, genuinely happy for them. With other pregnancy announcements I’ve gotten since Burrito and Tamale were born, from purported fertiles, I’ve been “oh how nice” happy. Just as if they announced an engagement, or a new job, or anything else. Back in the day, 1.5 to 8 years ago, I was often not-so-happy to hear pregnancy announcements. From those I knew had struggled, yes, happiness. From everyone else, whether or not I liked them, anywhere from a jealous twinge to a meltdown. Goodbye, bitterness. So long, fear. Goodbye and good riddance. How do you take the news of a pregnancy announcement these days? Does it depend on the person’s history? How has your reaction changed over time? I just came very close to getting on a plane to help my mother, then was able to avert the crisis. When I thought I was going to get on a plane the next day, I needed to find a way for Burrito and Tamale to be taken care of, because bringing them cross-country alone was not feasible. The babysitter will be unavailable the most of the days I would have been gone, and DH was supposed to go out of town again. Without a second thought, I called his stepmother to see if I could fly her here. I turned out not to need her help, but I am so grateful that I could depend on her. Willing and able to care for the twins, and eager to help me do anything I needed for my mother’s situation including hop on a plane with less than a day’s notice. Even after I told her that she didn’t need to come, she emailed me several times to say that if anything changes she’s ready to come anytime I call, that her bags are packed. She is completely stand-up. Her husband, DH’s dad, would also have come if we’d asked. He is also entirely stand-up. Other than that? No one else who could both be trusted to handle both of the babies and who would drop everything to come. No one else that we could truly rely on to pause their own lives, take care of two infants adequately, and do it all without holding anything over our heads later. There are some other relatives and friends that I could lean on for other types of emergencies, but this incident really cemented the hierarchy of who we can call in the middle of the night. How many people in your life are stand-up? How do you know for sure that you can count on them? Welcome to June’s Intelligentsia, the people who commented on every Thoughtful Thursday post for the month of May. #17: Wiseguy from Woman Anyone? #7: A from Are You Kidding Me? #6: Stacie from Heeeeere Storkey, Storkey! I just got a call from my dad. He and I have a fine relationship; we talk when we see each other in person, and we email, but we don’t call. If he’s calling, something must be wrong. There’s a crisis with my mother, having to do with her emerging dementia and her ability to function daily. Her mental issues are also affecting her ability to manage her own health care. My parents are now divorced, but he still looks out for her. My first thought was to get on the next plane. My second thought was that I can’t just hop on a plane across the country when I have two babies, leaving them with a husband about to go out of town on a business trip and a part-time babysitter. I also can’t bring them with me since there would be no one to care for them while I’m swooping in to deal with my mother. But honestly, even before I had children, I didn’t hop on planes when she had crises — largely because she is the type to refuse all help. Long-term, she’ll only be able to live independently for so long. Am I supposed to undercut my career and settle for any job I can find in her city? Am I supposed to have her uproot her life and come to live with us, spending more and more of my time helping her as she requires increasing care? Am I supposed to devote some huge chunk of my income to pay for her to live in a facility? I don’t want to do any of those things. This is when being an only child is particularly difficult, because I don’t want to do them but I can’t pass along or share the responsibilities. I know many people who have devoted years to caring for aging or ill relatives. I can’t see myself ever becoming one of those people. If my husband or children needed anything, of course, anything. Parents, grandparents, aunts, etc.? I just don’t think I have it in me. Maybe I’m too selfish, or too dedicated to the life I’ve worked so hard to build. At the intellectual level I can lament the lack of family-mindedness in our culture. I can tsk-tsk about the people in DH’s grandmother’s nursing home who never get any visitors or calls. I can condemn those who let one family member take the full burden of caring for someone while everyone else does nothing. But when it comes to my own life? I might just be one of those people. Or maybe I’ll change once my mother starts asking for help — or once she stops being herself and isn’t able to refuse help. For all of my mother’s flaws, she would do anything for me. She’s always been willing to do anything to make me happy. I’m afraid I can’t return the favor. How strong is your sense of family obligation? How far would you go? What are your limits?